As we continue to make contact with more supporters of a new passenger transportation feasibility study between Holland and Detroit, via Grand Rapids and Lansing, the Michigan By Rail team would once again like to take a moment to recognize another one of awesome supporters. As you can see from our list of the project’s supporters support is growing throughout the corridor. This week, we extend a big thank you to the Plymouth Community Chamber of Commerce! They stepped up in a big way with a $1000 match contribution commitment for the study. The Plymouth Community Chamber represents the City of Plymouth and Plymouth Township, both of which are located along the CSX line between Lansing and Detroit. Thank you very much for your support, Plymouth Community Chamber! Potential station locations have been identified in both the City of Plymouth and Plymouth Township. Pictured below is one of those locations, the former Plymouth train depot in Old Village, previously operated by the Detroit, Grand Rapids, & Western Railroad (DGR&W), the Pere Marquette Railway (PM), and later the Chesapeake & Ohio Railway (C&O). In Freshwater Transit’s concept of the Coast-to-Coast service, a possible stop is located in one of the industrial parks off of Beck Road in Plymouth Township. 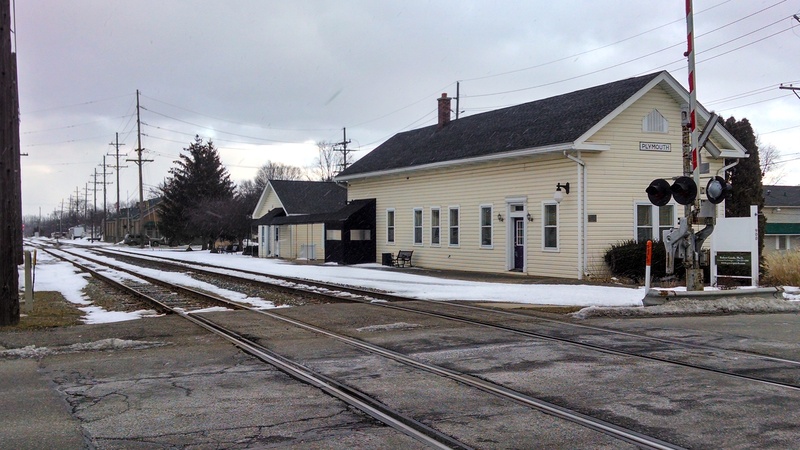 The former Chesapeake & Ohio rail station in Plymouth, Michigan, sits on one of the potential routes for the proposed Coast-to-Coast service between Holland and Detroit. The Michigan By Rail team is hard at work continuing to bring together key stakeholders throughout the West-East rail corridor who support a new study of the ridership potential between Holland and Detroit. From our Mitten’s west coast to its east coast, the list of supporters is growing. As passenger rail and public transit ridership numbers continue to reach new record heights, the demand for expanded service continues to grow. Keeping up with that demand strengthens the economic potential of our state and our region. If your organization or municipality is interested in contributing match funding or a letter of support for the Coast-to-Coast study, just give us a call at 517-999-0407, or email Dan at dan@environmentalcouncil.org. Can’t make the Plymouth meeting tonight, but would like to voice my support for coast to coast line.